Contributors Fundamental Analysis Aussie and Kiwi Outlook: Storm Clouds Gathering? Aussie and Kiwi Outlook: Storm Clouds Gathering? Both the Australian and New Zealand dollars have seen the wind leave their sails lately, amid mounting speculation that their respective central banks will cut rates soon, and as investors started having second thoughts about a US-China trade deal. Examining the landscape for each economy, the case for looser policy in New Zealand seems much clearer than in Australia, though market pricing currently implies roughly equal odds for a rate cut in both. This suggests that the risks surrounding aussie/kiwi may be skewed to the upside. The aussie posted decent gains to start the year, supported by encouraging signals in the US-China trade talks. Australia is an open economy that relies on commodity exports, so its currency is quite sensitive to the global trade outlook. Not to mention that China is Australia’s largest export and import partner. The close ties between the two imply that developments in China tend to be reflected in Australia over time, so the aussie is considered a “liquid proxy” for China plays. However, this optimism around the aussie came to a screeching halt last week, after Reserve Bank of Australia (RBA) Governor Philip Lowe walked back on some of his previous rhetoric that the next move in interest rates would probably be higher, indicating instead that he now sees even chances for either a rate hike or a rate cut. He provided several reasons for this shift. 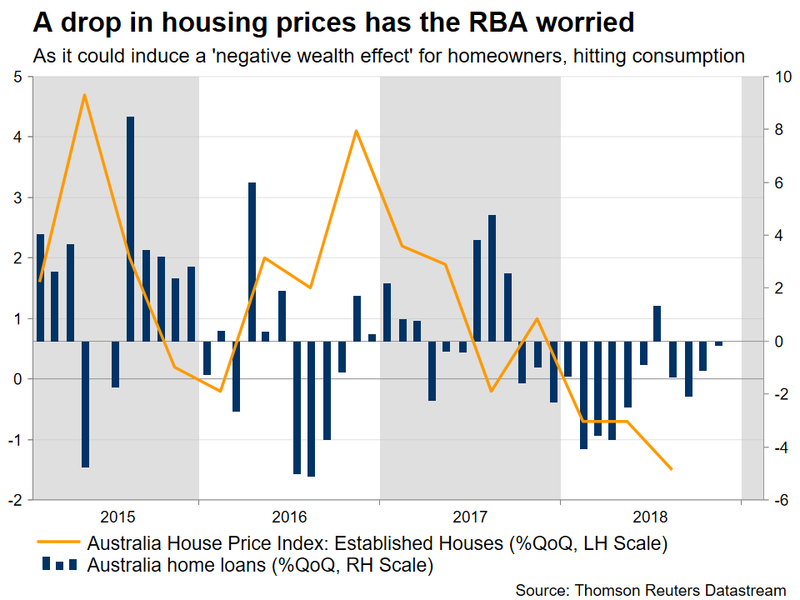 Trade tensions are still casting a shadow, growth in China is slowing, and Australia’s housing market is cooling, which may spill over into weaker consumption via a negative wealth effect for homeowners. Markets took these as a signal the RBA may be ‘laying the groundwork’ for a rate cut, with the implied probability for such an action this year surging to 85%, sending the aussie into a tailspin. Nonetheless, this looks as somewhat of an overreaction, with the information available today at least. Firstly, the cooling in the housing market was necessary and engineered by the RBA itself, as prices were previously soaring, threatening financial stability. 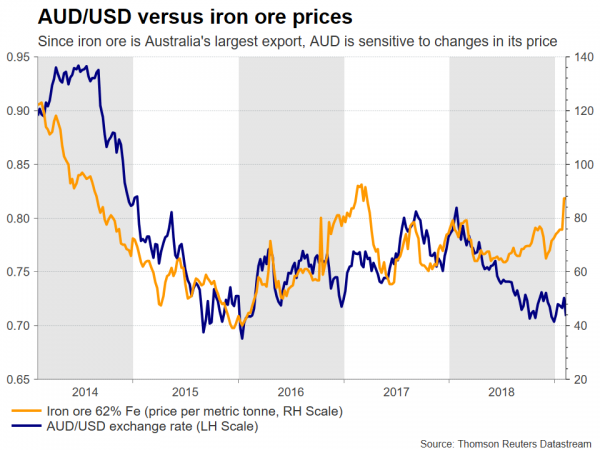 Secondly, the economy is still in a good shape, with the RBA’s latest forecasts projecting above-trend growth this year and Australia’s biggest export in iron ore seeing its price soar lately. Third, it’s an open question how much further China will slow. Authorities there have opened the stimulus taps – both monetary and fiscal – to counter the slowdown, so that could keep a ‘floor’ under growth. Finally, both the US and China still seem eager to reach a trade deal, though that may not happen until well into the middle of the year. To be clear, all the above don’t necessarily imply that the RBA won’t cut rates. It well might, but for that to happen it would probably take a further deterioration in economic conditions. This suggests that the elevated probability for a rate cut may be premature (for now), and that the Bank may instead opt to remain on hold throughout the year – unless the economy takes a sharp turn lower. Therefore, in the scenario that the Bank indeed takes no action this year, the aussie may manage to recover towards the latter half of the year. That said, the near-term direction will depend on how the trade saga plays out and how quickly China stabilizes, so some more pain may well lie in store before the currency can recover. Particularly in light of Australian federal elections coming up in May, which could add another headwind for the aussie by raising uncertainty. In other words, short-term pain but perhaps long-term gain, for the Australian currency. Across the Tasman sea, New Zealand’s economy has been losing momentum. 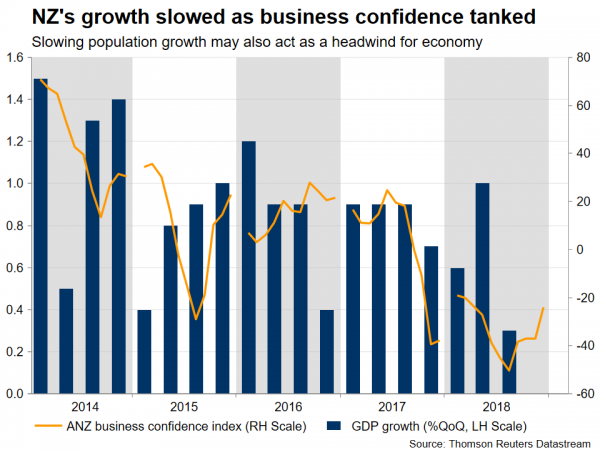 Growth was weaker than expected in Q3 2018 as tanking business confidence held back investment, and the available data for Q4 suggest the softness hasn’t abated. Another factor has been a major slowdown in net migration, which will likely continue to limit construction spending and consumption, and by extent, broader growth. Of course, there’s an array of external risks too, with trade tensions and the global economic slowdown topping the list. Yet, the kiwi held up rather well in the midst of all this, supported by hopes that the US-China talks could bear fruit and rising prices for dairy products, which constitute New Zealand’s largest export category. As for the Reserve Bank of New Zealand (RBNZ), it has been in a neutral ‘the next rate move could be either up or down’ mode for almost a year now, in the context of waning growth. Markets seem confident that the next move will be down though, assigning an 86% probability for such an action this year, which seems to accurately encompass the outlook. Besides plenty of signs that growth may remain sluggish, ranging from still-subdued business confidence to slowing population growth to signs of cooling in the labor and housing markets, there’s another factor arguing for a rate cut down the road. The RBNZ recently announced plans to raise the capital requirement ratios for commercial banks. This will be a slow process, but it suggests financial conditions will ultimately tighten and that banks may start charging borrowers slightly more. By extent, that could limit lending and dampen economic activity, implying the central bank could try to offset these negative effects by lowering its own interest rate. At the least, this would be yet another factor arguing in favor of a cut. Blending it all together, the RBNZ seems to be facing a variety of domestic risks, though just like with Australia, much will also hinge on the trade picture and China’s growth. Having said that, the case for looser monetary policy in New Zealand seems much stronger than in Australia currently. Attesting to this, the RBNZ has been saying that rates can move in both directions for a year now, while the RBA only said as much last week. So, not only does it seem more likely that the RBNZ could cut rates overall, but if the external environment deteriorates enough to cause both central banks to ease, any cut may also come sooner in New Zealand. Other things equal, this implies that the risks surrounding the aussie/kiwi pair may be tilted to the upside going forward. Technically, initial resistance to advances in aussie/kiwi may be found near 1.0535, with an upside break opening the way for a test of the January 9 highs at 1.0635. On the flipside, preliminary support to declines may be met around 1.0450, an area which capped several declines in recent months. Even lower, the February 6 lows at 1.0395 may attract attention.